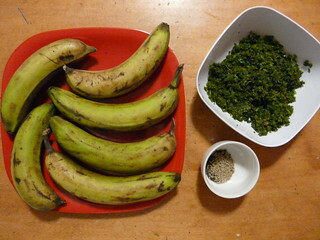 I normally associate plantains with Puerto Rican cooking, where they are served with most meals as tostones, fried twice to soften their starchyness and mashed flat the final time so they can be crispy all over and – if they’re at their best – smeared with a bit of mashed garlic, salty and crusty and utterly delicious. Or they can be left until they’re a bit riper and cooked into Pastelón, a Puerto Rican casserole that bears a faint resemblance to lasagna or moussaka – lovely layers of glossy fried vegetables, with the very light sweetness of the plantains a satisfying contrast to the salty seasoning in the hearty meat filling. Or they can be left until they’re completely ripe and have sugared and softened, then fried in a batter and served like instant melting pudding in a crispy sugared donut shell, with ice cream melting all over them. 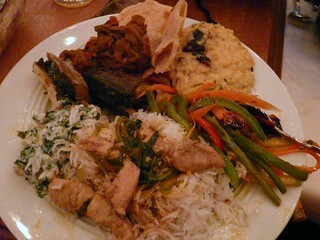 So… yeah, I really, really like plantains. But this isn’t any of those recipes. 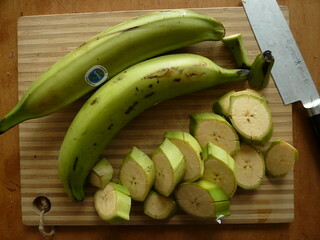 Cut plantains into thirds and cut a slit lengthwise that goes almost to the skin on the other side. Pack with spice mixture and set aside. In a large skillet, heat oil and add whole seeds. Cook over medium heat for 2 minutes or until spices brown and mustard seeds start to pop. Add plantains and turn until coated in oil. 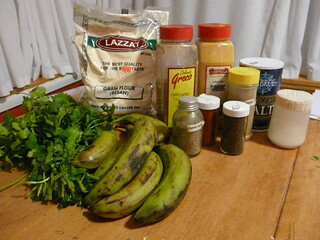 Simmer for 15-30 minutes, covered, turning occaisionally, until plantains are soft but not mushy. 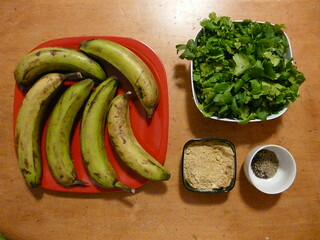 The time will depend on the texture of the plantains and the heat. Ingredient Note: I don’t think this recipe would be worth trying with normal bananas, the texture and flavor would be too different. The cookbook suggests trying it with zucchini, though. I don’t like zucchini well enough to try that, but if you have an abundance the flavor is very nice. I don’t have full illustrations for the hard part of this, which is judging how to cut and stuff the plantains and how much stuffing to use. We were caught up in a kitchen whirlwind of menu execution by that point in the evening, but this gives me a reason to pick up the right ingredients and do this again soon. I’ll update the photos and take out this note when I get that done.